New township: (From left) Miss Universe Malaysia 2012 Kimberley Ann Estrop- Leggett, Lee, Chor and Tan looking at a residential model during The Star Property Fair 2011 at the Kuala Lumpur Convention Centre Friday. KUALA LUMPUR: The Cabinet has approved a green neighbourhood and low carbon city framework and assessment system aimed at reducing the nation's carbon emissions. Housing and Local Government Minister Datuk Seri Chor Chee Heung said the guidelines would bring the country a step closer to achieving the goal of reducing its carbon footprint by 40% by 2020 as announced by Prime Minister Datuk Seri Najib Tun Razak in Copenhagen last year. “We are going all out to push the guidelines. “Studies have shown that urbanisation contributes more than 50% of greenhouse gases released into the atmosphere. Our small cities and townships are getting bigger,'' Chor said after launching The Star Property Fair 2011 at the Kuala Lumpur Convention Centre yesterday. Also present were Star Publications (M) Bhd executive deputy chairman Datuk Vincent Lee and chief events officer Iris Tan. A Cabinet paper on the guidelines was approved yesterday, said Chor, adding that it was a joint collaboration between his ministry and the Energy, Green Technology and Water Ministry. The guidelines, which would be distributed to local authorities, would promote 3R (reduce, reuse and recyle) practices as well as other environmental-friendly policies. “We hope developers will help spur green neighbourhoods by providing more cycling and walking paths to reduce vehicle use. “The guidelines are not compulsory but it makes good business sense to do it,” he said. Chor also congratulated The Star for organising the property fair which had not only attracted developers but lifestyle companies as well. On errant developers, Chor reiterated that the amendments to the Housing Development (Control and Licensing Act) 1966 would ensure “fly-by-night” operators are severely dealt with. The Bill, which is expected to be tabled in Parliament soon, would see errant developers facing criminal charges and jail sentences for abandoning housing projects. The Star Property Fair 2011 is open from 11am to 7pm and ends tomorrow. Entrance is free. 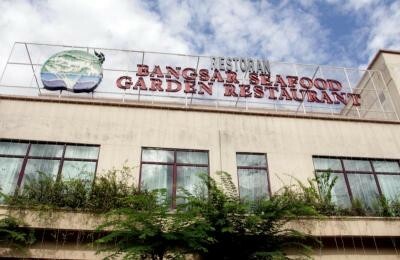 KUALA Lumpur mayor Ahmad Fuad Ismail said the Bangsar Seafood Garden restaurant in Jalan Ara Bangsar still has the right to operate until the Court of Appeal hears the case. Fuad said the developer of One Bangsar, Markibra Services, had procured a stay order and no date had been fixed for the hearing. The entire stretch along Jalan Ara Bangsar was filled with chic outlets like Sagar Restaurant, House of Tang, Signature Snips Hair Salon, CungDinh Vietnam Restaurant, Saigon, Divino, Zens Korean BBQ and Vincenzo Ristorante Italiano. 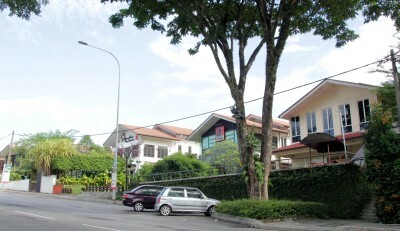 No more: Only the signboards are indications of the outlets that once operated in One Bangsar. About three months ago, the shops slowly started moving out following a court case that arose after the status of the land that was converted from residential to commercial expired in December 2009. Unhappy residents who had to deal with a host of problems opposed the renewal of the business licences and asked the Kuala Lumpur City Hall (DBKL) to revert the status to residential. The Markibra Services in turn filed a judicial review to stop the planning permission. However, City Hall won the case and Markibra has filed an appeal. Only the Bangsar Seafood Garden restaurant is still opearting along the stretch. Bangsar Baru Residents Association president Datuk George Joseph said it was up to the owner of the land, Eng Lian Enterprise, to propose future developments on the site. “Of course we hope to have developments that will benefit the community like a carpark. It will definitely reduce the number of cars double parked in the area,” he said. However George firmly said they would oppose any future plans for restaurants. According to him, restaurants would only increase noise pollution and traffic congestion. Lone ranger: The Bangsar Seafood Garden Restaurant is the only outlet still operating at One Bangsar. “We want the place to be developed because leaving it idle may turn the stretch into a dumping ground,” he added. Bukit Bandaraya Residents Association deputy president M. Ali said they preferred to revert the land status to residential. “The land should be used for bungalows according to the original plan,” he said. Eng Lian Enterprise Property Management head Tan Joon Kai said it was premature to have plans for the land. He added that they would wait for Markibra Services to enlighten them on the status before deciding on the type of development. Tan also said their company considered the feedback from the residents and business community important in the decision-making process. “We ultimately must ensure that the land will be used for the greater good of the neighbourhood,” he added. Representatives from Markriba Services could not be reached for comments.